Nothing in the world is more dangerous than sincere ignorance and conscientious stupidity. ~Martin Luther King, Jr.
It’s all about a simple gum bleeding, that you should actually not take it as just “simple” because when there is blood oozing out of your gums, there’s something deep that has to be taken care of, or soon this would get serious and bigger. Someone being ignorant to some level is quite understandable, but so much that they didn’t even notice that this was again linked to the general health condition, is a bit intolerable, but as a dentist we have a job to cure it rather than to get furious about it. 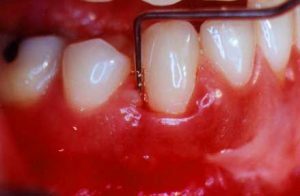 Bleeding gums are seen initially from the stage called Gingivitis, where its very easily treatable with the general scaling and stuff that can reduce the bleeding and makes the gums healthier, but have you ever tried to find out what lies next if you Ignored it? These are the above generally shared points by us to the patients who visit, but they later tend to ignore it when it’s just the bleeding gums. Eventually you are losing your tooth there. Isn’t it? Why not save it with the simple care and the right products? Now, let me share you an experience during my practice! There is a distant relative of mine, who was addicted to the Gutkha, Pan Masala stuff which is one of the aggravating factors for the most severe conditions ever – Cancer. Luckily he got rid of the habit slowly due to the pressure from his family, but when I entered the dental practice, he came to me when forced from his family members to get it checked for the discolored teeth. I checked, and rather than the discoloration of the teeth (caused due to the Gutkha), it was the bleeding of gums that dragged my attention, and the teeth were a bit loose already. I made him understand that he should get the necessary treatment for that done, but he ignored that asking me to go for some teeth whitening procedure to make the teeth white. That’s how easily one would ignore the root cause of the future problems. The effort to make him understand went for no use, and later he came to me a few months later with severely loose teeth and the gums totally receded exposing most of the tooth structure, till half the length of the root which is normally inside the gums. The first thing that came into my mind was not the gum health directly, but some other factor – Diabetes. Got it checked, and yes he didn’t know it but was diabetic. So, you started ignoring from somewhere and ended up somewhere. It’s a general step in the treatment of loose teeth that we ask the patients to get the sugar levels checked. Had this relative of mine got the treatment of the bleeding gums and loose teeth treated then, we could have know about the Diabetes at that time, when things would have been kept in control. Now, he’s having the full set of dentures after losing all the teeth and the bone below also being not strong enough to support some of the advanced treatment procedures like the Dental implants. Moral of the Story: A strong message to everyone who brush their teeth, notice the blood when they spit, ignore it and then make it a routine. There are several causes, several factors that can lead to bleeding gums, and that bleeding gums can lead to. Do not ignore it. – Brush regularly, using a soft toothbrush which can assist in massaging of the gums, and use a proper toothbrushing technique rather than using a force to remove the food debris from the gaps between the teeth. – Get regular health check-up done, to rule out any general health conditions which could be a reason for the problem. – Have healthy food, which include the raw vegetables which strengthen and increase the health of the gums. – Importantly, use some recommended and well known toothpaste brands which are proven to provide a good care to the gums. This article is written for the My Healthy Speak Blog as a part of the ongoing contest on Indiblogger! What are the causes of bleeding gums? How smoking affects the health of gums? Thanks for this informative post. My gums are exposing some part of the teeth which should be covered actually. The reason for it is that my upper teeth are inclined inside. When I close my mouth, the upper teeth comes in contact with the lower gums and due to the constant friction the gums are being damaged and the tooth portion which should be actually covered by gums is exposed. Can you suggest me some treatment?